In 4- to 5-quart slow cooker, mix onion and tomatoes. If beef roast comes in netting or is tied, remove netting or strings. Place beef in slow cooker. In small bowl, mix bacon, garlic and Italian seasoning; rub over beef. Remove beef from cooker. In small bowl, mix cornstarch and water; stir into tomato mixture. Return beef to cooker. Cut large mushrooms in half. 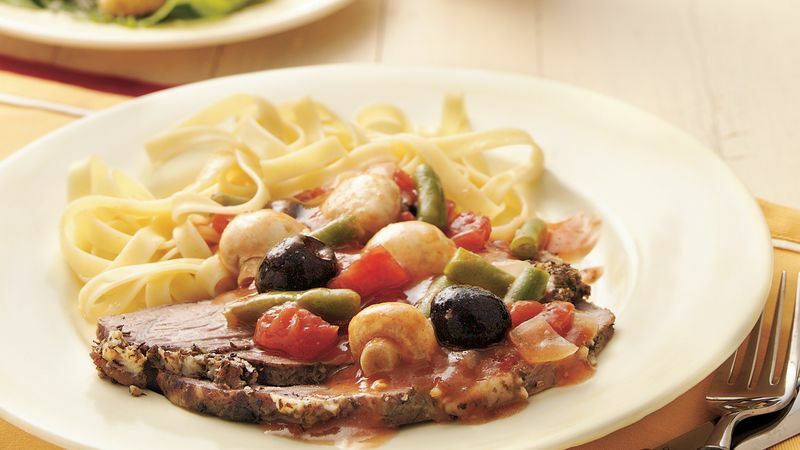 Arrange mushrooms, beans and olives around beef. Increase heat setting to High. Cover; cook 20 to 30 minutes until tomato mixture has thickened and vegetables are tender.